shortening, so this is the recipe I used. YUM! Add the sugars, and beat for 2 more minutes. 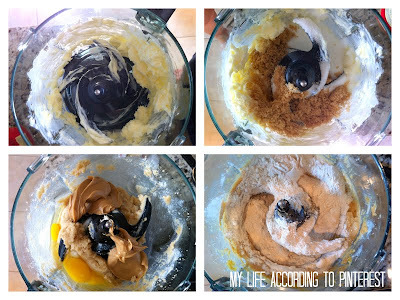 Mix in the peanut butter and egg. Mix the dry ingredients into the sugar butter mixture. Bake until light brown, 9 to 10 minutes. While the cookies are baking, unwrap all of the Dove chocolate hearts that you are going to use so they are ready to go. After you pull the cookies out of the oven, press one Dove chocolate heart right in the middle. Cool on baking sheets for a minute; transfer to rack to cool completely. It takes a kinda long time for the chocolate hearts to cool, so don't stack these cookies for awhile. Why didn't I think of adding Dove Chocolate? They're SO MUCH better than Hershey's. Thanks for the idea. Hope to bake these yesterday. I know! 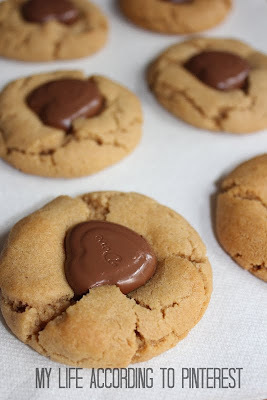 So, easy to transform into a Valentine's cookie. And super delicious!